The School Leaders Licensure Assessment was designed in accordance with the high standards set forth by the Educational Leadership Policy Standards: ISLLC 2008 and a National Advisory committee comprised of expert education practitioners. The assessment is intended to ensure entry-level leaders in the field of education are able to demonstrate their relevant knowledge and adherence to competent professional practice. If you are seeking a leadership role in the field of education, the School Leaders Licensure Assessment will allow you to meet licensure requirements, barring any other criteria in the state in which you intend to work. Prepare with our SLLA Study Guide and Practice Questions. Print or eBook. Guaranteed to raise your score. Get started today! What fees are associated with the School Leaders Licensure Assessment? The School Leaders Licensure Assessment (6011) will cost $425 at registration, which can be completed online via the ETS website. Registering by phone will cost you an additional $35, and changing your test date or center will cost $40. If you need additional score reports, you will be assessed $50 per report. What is the passing score for the School Leaders Licensure Assessment? The passing score for the assessment depends on the state in which you live and work. If your state uses the School Leaders Licensure Assessment for licensure, check the ETS School Leadership Series website for details. Some U.S. territories, such as the U.S. Virgin Islands, require a score as low as 156; however, other states, such as Mississippi require a score as high as 169. What does the School Leaders Licensure Assessment cover? SLLA Flashcards. 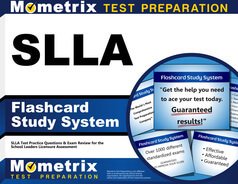 Proven SLLA test flashcards raise your score on the SLLA test. Guaranteed. The School Leaders Licensure Assessment (6011) is a computer delivered exam consisting of 100 selected-response (multiple-choice) questions, and 7 constructed-response (written) questions. You will be allotted 4 hours to complete the entirety of the exam. Section I will take approximately 2 hours and 20 minutes to complete, while Section II will take approximately 1 hour and 40 minutes to complete. Make sure to answer each question to the best of your ability, and in the interest of time, try not to get stuck on any one question. The most effective means of guaranteeing you pass the School Leaders Licensure Assessment (6011) on your first attempt is to prepare using the most reliable test preparation materials available. 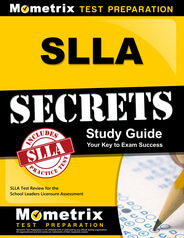 Mometrix Test Preparation has everything you need in the SLLA Secrets study guide, including authentic SLLA content, in addition to professional tips designed to help you reduce test anxiety, recall information, and pass the School Leaders Licensure Assessment on your first try. In addition to the SLLA Secrets study guide is the complete SLLA Practice Test and comprehensive SLLA Flashcards. Take the most direct path toward passing the SLLA on your first attempt: read the SLLA Secrets study guide, evaluate your knowledge with the SLLA Flashcards, and test yourself with the SLLA Practice Test. The sooner you pass the SLLA, the sooner you earn your state licensure in educational leadership.